Sign your family up for breathtaking ocean views, beachside accommodations, and plenty of ocean activities at La Jolla Cove Suites. The surrounding areas of the charming San Diego community offer endless entertainment, including the seal-friendly Children’s Pool Beach, the La Jolla Playhouse, snorkeling in the Pacific Ocean, SeaWorld theme park, and the famous San Diego Zoo. 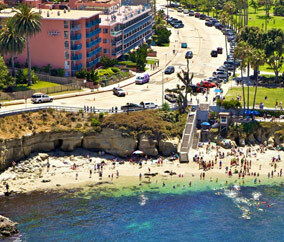 Members receive up to 5% cash back off room rate after stay plus discounted tickets to the San Diego Zoo. Whether you’re planning your next family vacation or an adults-only romantic escape, La Jolla Cove Suites will fulfill all your visions of the ultimate getaway. It’s premier location and exceptional hospitality make this affordable beach hotel the perfect choice.